National Right to Life Committee is urging members of Congress to vote in favor of H.J. Res. 43 which would nullify pro-abortion legislation passed by the District of Columbia. The pro-abortion legislation in question could force prolife organizations in the District of Columbia to hire pro-abortion employees. The National Right to Life Committee (NRLC) advocates for recognition that each unborn child is a member of the human family, and that each abortion stops a beating heart and ends the life of a developing human being. That viewpoint is shared by many women who once believed otherwise and submitted to abortions, and by many men who once believed otherwise and were complicit in abortion; such persons number among the most committed activists within our organization and other pro-life organizations. Yet it would be intolerable for an advocacy organization such as ours to be required to hire, or prohibited from firing, a person who makes a "decision" to engage in advocacy or any other activity that is directly antithetical to our core mission to lawfully advocate for the civil rights of the unborn. Under the RHNDA, using any "decision . . . related to" abortion to inform decisions about hiring, firing, or benefits (among other things) would expose our organization both to enforcement actions by the District government bureaucracy, and to private lawsuits (some of which would likely be engendered by "sting" operations by pro-abortion advocates). At Right to Life of Michigan we have a new job opening for Director of Communication/Education. Applications are due by May 7. Learn more about this exciting opportunity at our web site. After spending a month attempting to allow federal funds to be used to pay for elective abortions, Senate Democrats agreed to end their filibuster of the Justice for Victims of Trafficking Act and allow a vote on the legislation. The agreement prevents federal funds for being used to pay for abortions and retains Hyde Amendment language in the legislation. Democrats repeatedly blocked an earlier version of the proposal, arguing it would create an expansion of the Hyde Amendment, which restricts the use of federal funds for abortions. The deal that resolved the stalemate requires money for the victims’ fund to come from two sources: criminal fines and money that Congress previously appropriated. Republicans also shot down a last-ditch effort by Democrats to strip the abortion provisions from the legislation, which if successful would likely have killed the bill. Data released by the Michigan Department of Community Health showed an increase in the number of reported abortions performed in 2014. A total of 27,629 induced abortions were reported in Michigan in 2014, which was a 5.8 percent increase from the total of 26,120 reported in 2013 but a 43.7 percent decrease since 1987 (the year with the largest number of induced abortions). Chemical abortions (non-surgical) increased in 2014. In 2014, 6,935 chemical abortions were committed which is up from the 5,103 committed in 2013. Michigan residents received 95.3 percent of the induced abortions that occurred in Michigan in 2014. The data shows an increase in the number of women from other states coming to Michigan for abortions; in 2013 there were 708 non-Michigan residents who had abortions and in 2014 that number increased to 1,317. The trend of declining abortions committed on girls under the age of 18 continued. In 1990, 3,820 abortions on minors were reported. The reported figure for 2014 is 917. This represents a 76 percent decrease since 1990. No matter what the procedure or where the mothers come from to have an abortion, we are deeply saddened by the loss of precious lives. While the overall trend of decreasing abortions is encouraging, this year’s increase and the annual overall numbers serve as a reminder that our prolife efforts must continue - lives depend on us. In 2009, Antonesha Ross died after receiving an abortion at Women's Aid Clinic in Illinois. In an effort to get out of paying a state fine for one of their patients dying and the deplorable conditions at the clinic, the abortion clinic changed their name to Women's Aid Center. Unfortunately, a group of judges is letting the clinic off the hook. The Illinois Department of Public Health challenged that interpretation, pointing out that the new clinic has two of the same phone numbers as the old clinic and that for a while it had the same website and location. The state sought $3,135 held in the new clinic's bank accounts, arguing that the money could be traced to the old clinic. The old clinic was fined $9,000 for failing to specify in writing which medical conditions would make a patient ineligible for an abortion, a violation stemming from the care of Ross, who died of severe pneumonia a few hours after a first-trimester abortion. The clinic was also fined $18,000 for failing to hire a registered nurse to supervise care and circulate in the operating room, and $9,000 for sanitary and equipment issues. (May 10) and Father's Day (June 21). Supplies are limited. 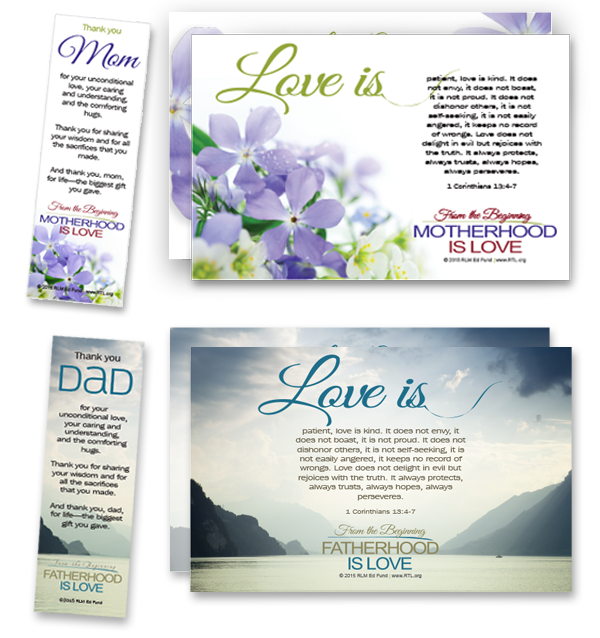 Click to view and order the 5.5" x 8.5" Love Is bulletin inserts featuring 1 Corinthians 13:4-7 and the 2" x 6" bookmarks featuring poems thanking Mom and Dad for life.